That time is upon us; a new gimmick is upon us: TAG TEAM Pokémon. If you haven’t yet, consider reading the official website’s take on things. There may not be as much overlap as you would expect, because the article s more about the specific TAG TEAM cards and less about the general mechanic. It is also why I keep capitalizing TAG TEAM; the card does it, even in places where you’d expect it to just be rendered as “Tag Team” and the official article does it as well. So, what are they? A TAG TEAM Pokémon features two Pokémon in both the card’s art and name. For example, one of the first ones we’re receiving is named Eevee & Snorlax-GX and if you look at the artwork, Eevee is front and (off) center with Snorlax right behind. Of course, the art doesn’t affect gameplay; it isn’t like we haven’t hard cards that depicted multiple Pokémon before. What is new, because unplayable promos don’t count, is that the card’s name reflects this. You can run this card regardless of how many Eevee, Eevee-GX, Snorlax, Snorlax-GX, etc. cards are also in your deck, provided you don’t exceed your maximum deck size. Since “-GX” is in the title, all the usual aspects of being a Pokémon-GX apply, whether it ends up being to the card’s benefit or detriment. You’ll also see a yellow box with “TAG TEAM” under the name and in what would normally be the upper lefthand corner of the art. You won’t find the GX-Rule on this card, however; that isn’t a good thing as it has been replaced by the TAG TEAM Rule, printed on the card in the lower righthand corner, below the Resistance and Retreat Cost. It states your opponent takes three Prizes when the TAG TEAM Pokémon in question is KO’d! In your typical Constructed Format game, that means your opponent takes HALF their starting Prizes when one of your TAG TEAM Pokémon go down. The good news is that TAG TEAM Pokémon are designed with this in mind. I don’t recall every TAG TEAM Pokémon which has been revealed, but so far they are all Basic Pokémon… even Greninja & Zoroark-GX. While so far only the Japanese version of the card has been revealed, it is clearly a Basic Pokémon even though neither Greninja nor Zoroark typically are. This means you can immediately play a TAG TEAM Pokémon to the field, even use it as your opening Active if it shows up in your initial hand. I do not recall seeing any TAG TEAM where the featured Pokémon didn’t share a Type, and the shared Typing determines the card’s Type. I mean, from a card design standpoint. It clearly says the card’s Type in the corner where it usually states such a thing, and the card’s background coloration, at least what you can see of it beyond the Full Art imagery, is also Type-appropriate. The first place we really get an idea of what it is like to be a TAG TEAM Pokémon, however, is the card’s HP. 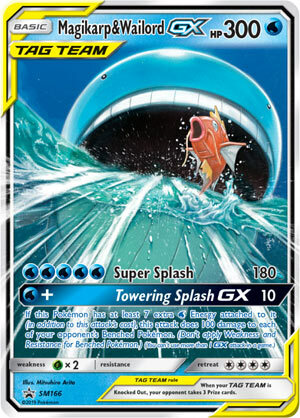 I don’t think I’ve seen a printed maximum HP score on any TAG TEAM Pokémon of less than 240, and the new Magikarp & Wailord-GX now holds the printed maximum HP record by clocking in at 300 HP! Nothing unusual about the bottom stats; I haven’t seen any abnormal Weaknesses, Resistances, or Retreat Costs. The TAG TEAM Pokémon we have seen one or two regular attacks plus a GX-attack on every TAG TEAM Pokémon so far. I do not recall any with Abilities, but they could be coming. It is subjective, but I believe the usual attacks all show at least a tiny “bump” in damage and/or effects, relative to what you’d see on a baseline version of either member of the TAG TEAM. A common thing with all the GX-attacks is that they’ll do one thing if you only pay their base cost but will do another thing if you have sufficient “extra” Energy attached. 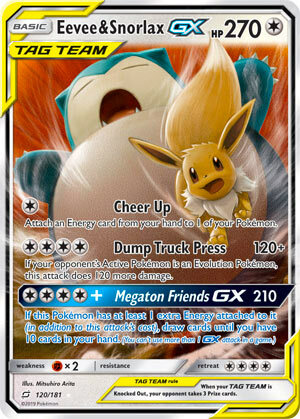 Getting back to Eevee & Snorlax-GX, its “Megatron Friends-GX” attack costs [CCCC] to do 210 damage, but if you have one extra Energy attached to it over what is required to use the attack, you ALSO get to draw until you have 10 cards in your hand. It is probable that most TAG TEAM Pokémon aren’t going to be very good; it is easy to forget how many Pokémon-GX and Pokémon-EX before them were released and never actually proved competitive. Most Pokémon cards aren’t competitive as is, after all. It doesn’t take more than a few to define the metagame… again, just like Pokémon-EX and Pokémon-GX before them. The massive HP scores should help some find use as walls, and as long as they have half-decent attacks, dropping a Basic Pokémon-GX with 240 to 300 HP when you have LESS than three Prizes left nullifies one of their major drawbacks, just like it does when you drop a Pokémon-GX and only have a single Prize left. The insanely expensive GX-attacks may be game winners or simply Johnny-bait.